In February 2013 the notices went up announcing auditions for X-Factor Israel. The first stage of auditions were in front of the show producers and they approved those who would go on to audition in front of an audience of 10,000 and the 4 judges. These were the most talented, the least talented and the strangest - something that makes for an interesting television episode where laughs are as important as gasps of astonishment at the amazing talents that had not yet been discovered in our midst. The judges accepted 80 promising singers to continue on to the bootcamp stage. Following the bootcamp, the 80 auditioned again in front of the judges and 20 were selected to continue. These were divided into four groups, each judge taking one group: female singers, male singers, groups, and older singers (over 25). Come join me for a wrap-up of the season as we move toward the grand finale. I put this article together on December 30, with 7 competitors still in the running. I will update as we go. 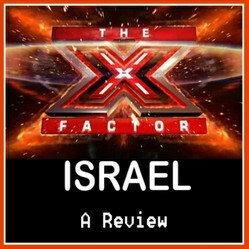 DRAMATIC UPDATE: 8 January 2014 - is X-Factor Israel rigged? FINALS UPDATE: 14 January 2014 - the winner! In 2004, Simon Cowell created the X-Factor, a term used to denote that little special "something" that distinguishes a good singer from a star. He franchised the program and it has been produced in over 40 countries around the world. 28 YO Bar Rafaeli has made a spectacular modeling career in the international arena and has done some acting. However, she does not really have the experience to handle such a huge assignment and while she is certainly easy to look at, she has neither the confidence nor the easy going repartee to manage a show of this caliber. She was wonderful behind the scenes at the auditioning stage of the program, supporting the candidates and rooting them on from the side with their families and friends. But she kind-of gets lost on the stage. To the left, we see the Israel X-Factor judges on their way from the airport to the hotel when invited to London to meet Simon Cowell and get last-minute instructions and encouragement before the show goes on the air. They are, from left to right: Rami Fortis (who got lost in London and never made it to the meeting with Cowell because he insisted on some sightseeing on his own beforehand), Moshe Peretz, Ivri Lider and Shiri Maimon. 30 YO Moshe Peretz was born in Tiberias and worked as a hair-dresser before he succeeded in his musical career. Today he is a highly respected singer and composer of Oriental Israeli music. He jokes that anyone who wants him to do their hair has to pay the cost of a performance. 59 YO Rami Fortis, born in Tel Aviv, is the "bad boy" of Israeli music (well, one of them, the oldest one of them). He was a pioneer in punk rock music in Israel and for 10 years lived outside the country until Israel was ready for his kind of music and onstage antics. Today he is well respected and maintains his somewhat crazy ways that are rather endearing (because they are not extreme). Prolific musician from Kibbutz Givat Haim, 39 YO Ivri Lider, has worked with many Israeli musicians over the years. He is well loved and respected. Since high school he has composed music for theater, dance and film as well as producing his own albums. 32 YO Shiri Maimon, born in Haifa, developed a successful singing career after being runner-up for the Israeli Idol competition in 2003. In 2005, she represented Israel in the Eurovision Song Contest. She has been successful both in Europe and in Israel. I just found out from my daughter that they were in the same class together in junior high school. I loved that we could see many of the auditions. There were so many funny moments. Some people who thought they were really good and really were not. Some who were even indignant about being rejected, huffing off the stage, saying the judges obviously know nothing about music! One said she's going to America where she will be appreciated! There was one particularly obnoxious guy who dressed weird and was very insulting toward the judges. He made overly dramatic movements in his attempt at dance. What was even more amazing was that he was brought back by the production crew as a surprise performer last week, put together with real dancers and apparently taught to move with more elegance. With this guidance, he actually sang quite well. The judges were quite clearly not pleased to see him and he remained his obnoxious self after the song. If he had just shut his mouth except to sing, he may have redeemed himself. After the bootcamp, 80 candidates had to re-audition in order to remain in the running. There were to be 5 female singers, 5 males, 5 groups and 5 over-25s. The judges were so upset at having to send these 5 men home so on the spur of the moment they came up with the idea of keeping them on - as a group. This worked out great since there were only 4 other groups that were good enough to continue and this new group made up the requisite 5. Simon Cowell wrote to them, saying they needed a name. Fusion was one of his suggestions that sounded good to them. Sounds good to me, too. I love these guys. To think that in the 3 short months they have been working together they have achieved a degree of, well, fusion, is quite remarkable. Rose Fostanes is a Filipina caregiver who came to Israel for a job so that she could support her family back home. She always had a dream of being a singer and in Israel, X-Factor gave her that chance with a big standing ovation. She is a favorite to get into the finals, but she will need to take some chances and sing something in a different style because so far, all her songs have sounded too much alike. Her life will never be the same now. This sweet young singer from a development town near the northern border of Israel (meaning really out in the peripheries of the country) had never been on a stage before the moment of her audition. The judges remark about her tiger overall and she jokes back with them, telling them she got it in a flea market for under $10. As the show goes on over the weeks, she gets more and more elegant and her beauty shines, but does not outshine her sweet demeanor. Here, in her audition, she mispronounces the name of the song, is so nervous at the beginning, then grows in confidence and puts on a great performance, finally breaking down at the end from the excitement of it all. She also stands a good chance of making it to the finals. Tamar is most comfortable with her guitar. Without it she stands woodenly on the stage. This song is called "If There Is a Heaven" and is about coming home to mother. At 15, Inbal is the youngest contestant in the contest. She has shown the greatest variety of styles so far. This song was written by judge Ivri Lider. She has a very good chance of getting to the finals. Uri took a chance when he auditioned with his own song. Here at this late stage of the competition, he repeats that same song. He is much more interesting with his own material than when he sings other people's compositions. I hope he keeps this up. This song is called, "Understand" and cries out to a woman who left to understand what she did to him by ending their relationship. This was their best song until now. I wasn't a great fan of theirs until now, but this is a decent performance. Unfortunately, they cannot maintain a steady level, going up and down in quality. Apparently not everyone agrees with me. I would have let this pair go quite a while ago. The woman on the slides in the background is Yan's girlfriend and the same one he goes down in the audience to hug at the end of the song. At 27, this man has what it takes. It's not clear why he was eliminated at this stage. The judges all said that he is already a polished performer and should have no trouble making it now that he has become visible to the world of music through this program. Maybe he's just too good. He has charm on stage and in the wings, flirting with Bar Rafaeli, and his flirtatious manner on stage during his first audition, worked. The judges took an immediate liking to him. The brothers, Tommy and Yan, and Tamar Friedman. I was sorry to see Tamar go, but I think the brothers overstayed their visit. It is getting so close now - all the remaining singers are so very good. Many are saying the competition is rigged. For yesterday's show, the home audience selected the contestants' songs and costumes from a small list of possibilities. They did an admirable job of choosing, but one or two songs were not really totally suited to the singers. At the end of the evening, Inbal Bibi, one of the favorites to get into the finals, if not win, was eliminated, supposedly by vote of the audience at home only, without input from the judges. That is surprising to many because the group, Fusion, was up for elimination more times than any other group or singer. It is true that as time progresses, these 5 guys sound more and more like a seasoned group - and that is remarkable since one is native-born Israeli and the others are new immigrants from France, Britain, the USA, and Columbia. It is possible that the judges and/or production want to feature these guys as a great accomplishment of X-Factor Israel, and to eliminate them, even at this late stage, would drop them soon into X-Factor oblivion. Not only that, but eliminating the group would have left 1 judge with no more contenders and 1 judge with 2. Oh well! Who said life is fair! There is a bit of a fuss being raised on the X-Factor Israel Facebook page. While all the contestants are top-quality, I was very surprised to see Inbal go. Perhaps, given that she is only 15, it was believed that she has still a long and bright future ahead of her. The finals performance was spectacular! Everyone put on a great show with great polish. Israel's first X-Factor featured so many talents from so many places - Rose is here on a working visa and she has now dramatically changed her life. Here she shows her range. Brilliantly. Do you get X-Factor in your country? Isn't it amazing how much talent is hidden away until reality TV discovers them? How nice to hear I can take credit for you joining Wizzley. Welcome. I'd like to see some of those videos, younghopes. Could be interesting. Yes, I know, cmoneyspinner! It took us forever to get the X-Factor! X-Factor in Israel? Well it took them long enough! :) My husband turned me on to world music decades ago. I love this stuff!! Thanks for pinning this! This article is dedicated to everyone involved in making The Voice of Romania such a great show: contestants, production team, TV audience. Videos included.